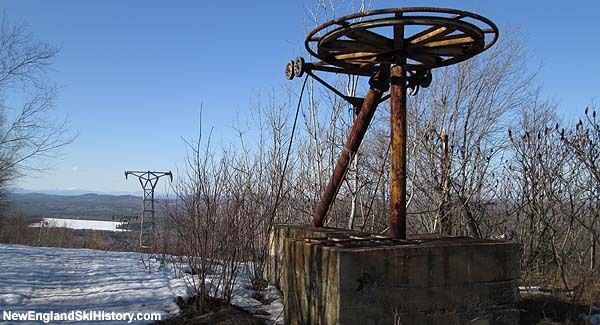 Located east of Copple Crown Mountain in the southeast corner of the Lakes Region, Moose Mountain operated as a ski area for nearly three decades. Two decades after closing, the area began a gradual reemergence as recreational facility. Moose Mountain officially opened to an estimated crowd of 3,000 on December 31, 1961, likely served by a Mueller double chairlift and T-Bar. Popular trails that season included the expert lift line run named Whizbang and the novice Big Moose. Tom Mahoney took over as general manager for Moose's sophomore season, which ended up 23% ahead of its debut season performance. Despite this, Moose soon found itself in financial trouble. Paul Cossette took over Moose Mountain in 1964-65, providing financing and overseeing improvements to the base lodge, parking area, and adding a beginner rope tow. Copple Crown ski area opened on the opposite side of the ridge in 1965-66, initially enjoying some regional attention. The area eventually fizzled without reaching its full potential. A second T-Bar was installed at Moose Mountain in 1968-69, serving the Jer-Cee novice slope. The ski area may have been briefly named Limberlost Club circa 1970. The name was quickly restored to Moose Mountain. Snowmaking may have been briefly in use during the 1970s. The main lodge burned down in late March of 1976 and was subsequently rebuilt. The area likely closed following a series of ownership structure changes in the late 1980s, perhaps as late as 1988-89 or 1989-90. Moose Mountain Recreation LLC was registered in June of 2008, sparking hope of changes at Moose Mountain. Starting in 2009, the area has been gradually redeveloped for snow tubing and snowmobile use. The tubing facility, located on the former Lil's Fancy slope, includes a handle tow, lights, and snowmaking. A new disc golf course debuted during the spring of 2013. The tubing facility was shut down prior to the 2015-16 season due to high insurance costs. It is not known if or when lift served skiing will return to Moose Mountain. "Had a lot of fun skiing at Moose up and down the Mt all day long Good memories That was a long time ago "
"I went to work at moose mtn in 1964 at the age of 10 years old worked there for about 28 year's until 1991 when the area closed"
"I learned to ski @ Moose in the early sixties. My dad was head ski patrol and mom a ski instructor. I was on the ski team there as well. My family have many great memories of Moose - it was wonderful growing up so close to the Mountain. I would meet friends from high school there for some great night skiing. To this day, I hike Moose on a regular basis. Thank you for the wonderful memories!! February, 2017. " "Learned to ski at Moose in very early sixties. My family had a lifetime pass. Some real characters in the ski world passed through Moose. Happy memories"
"Wow...Think i remember skiing there probably late 1970 or 71 or even 69...a couple times, my uncle lived in nearby Milton Mills...Always some good snow in those days especially late in season, (the memorable blizzard of Feb.9, 1969 was what really got us in to skiing..(that and good economy)..Lift tickets incredably reasonable...gas low too....wow what recreation for such a reasonable price...a quiet absolutely commercial-free atmosphere almost with the air of an outdoor saloon/public library with snow, healthy skiing and lodge with a fire place....pleasant indeed...."